We call investing in a stock “risky” because the company might go out of business. We call investing in stocks via a mutual fund “risky” because the stock market is volatile. Long-term bonds are “risky” because they’re subject to price volatility resulting from changes in market interest rates. Foreign investments are “risky” due to fluctuations in exchange rates. Savings accounts and CDs are “risky” because inflation can consume your entire return. In my opinion, trying to have an intelligent conversation using the word “risk” (as opposed to indicating what kind of risk) is comparable to having a conversation using the word “investments” without ever distinguishing between stocks, bonds, CDs, or real estate. In a few instances it will work, but most of the time it’s just going to cause problems. Imprecise definitions certainly make writing difficult, but more importantly they cause confusion. I think the fact that we refer to so many different concepts using the same word causes severe misunderstandings among the investing public. We’ve made it easy for people to come to the conclusion that a decline in the market is the same thing as a loss of money, when in reality, that’s only true if you’re going to be selling soon. And–now that we’ve convinced investors that market decline = loss of money–can we really blame them when they get out of the market after a big drop? After all, if you were thinking “Oh my god! Everyday I stay in the market, I’m losing more and more money!” …you’d want to get out of the market too, right? Too bad we didn’t explain what we meant when we said the market was risky. I think we could all benefit from being more precise with our wording when we call something risky. Earn 15% annually in the stock market. Given that I’m currently working on a narrative-style investment book, I figured it would be a good idea to read some of the others in the field. A couple weeks ago I read (and thoroughly enjoyed) The Richest Man in Babylon, and over the last couple days, I read David Chilton’s The Wealthy Barber. The most recent version of the book has a copyright date of 1998. And boy does it show! (And I’m not even talking about the references to saving up for a VCR, which must have been left in from a version even earlier than ’98.) I’m talking about the assumed rate of returns in all the investment examples. Over and over, Chilton uses an assumed annual rate of return of 15% for investments in equity mutual funds. 15%! He also states that an “ultraconservative allocation” should easily be able to earn an 8% rate of return. Funny: Just the other day I was predicting an 8% long-term return in the stock market–and I was saying that we should be excited about it! I find it fascinating that Chilton–an author who expounds the virtues of conservative investing (i.e., suggesting CDs in IRAs for people in their late 20’s)–was caught up in the absurdly optimistic expectations of the era. I guess it’s hard to escape. By the way, for anybody who’s curious: From January 1, 1998 to December 31, 2008, the market’s actual annual return was a mere 1.03%. Looks like he was a little off! Hehe. Kalinda (my wife) recently started a cooking blog. 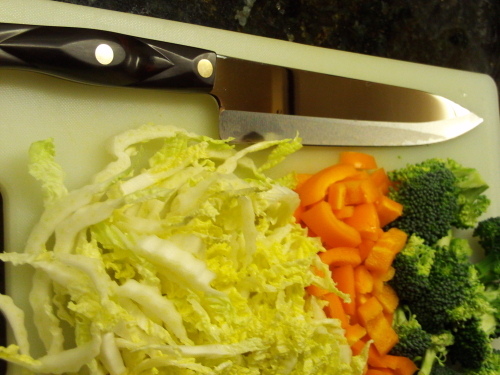 What this means for me–aside from an abundance of delicious, homemade meals–is that I end up dicing/chopping vegetables most nights. A recent close call with a chef knife got me thinking. If used improperly, they’re dangerous. If used for the wrong job, they’re dangerous. When used correctly, and for the right purpose, they get the job done in a (fairly) safe manner. If used improperly (buying and selling with great frequency, or owning a portfolio that’s not sufficiently diversified), they’re dangerous. If used for the wrong job (short-term savings, for instance) they’re dangerous. When used correctly, they get the job done in a fairly safe way. How to use stocks properly and safely? Own a diversified portfolio via a low-cost fund. Hold them forever (or as close to forever as you can manage). As we’ve previously discussed, over (very) extended periods, the market’s return is made up almost entirely of dividend yield and earnings growth. In other words, one of the best methods for predicting the long-term rate of return for the entire market is to simply add the current market dividend yield (3% at the moment) to our economy’s average rate of earnings growth (5-6%). This tells us that for every dollar we put into the market right now, we can expect a long-term rate of return in the 8-9% range. Many people may see that number and get disappointed. After all, you don’t get rich quick(ly) with an 8% rate of return. That said, I look at this number and see two great reasons for investing in the market. It hasn’t looked this good for quite a while. When was the last time that the market was offering a dividend yield of 3%? Almost two decades ago: 1991. If you’re feeling scared to invest in the market right now, take a moment to ponder that. The market’s expected rate of return hasn’t looked this good since before Clinton was in office. It’s a heck of a lot better than what we can expect from bonds. Right now, 10-year treasury bonds are yielding roughly 2.5%. In other words, the stock market’s dividend yield alone is enough to make it more attractive than the alternative. Once we add in the future earnings growth, we get a very substantial difference in long-term expected rates of return. We haven’t seen this kind of discrepency between bond yields and expected market return in a long while either. Just for comparison, if we look back a few years ago to 2006, the market’s dividend yield was about 1.77%, giving a projected market return of roughly 7%. That’s barely any higher than the bond rate (about 6% at the time). And yet, people were confident investing in the market. The numbers tell us that now is a great time to invest–better than it’s been in over a decade. 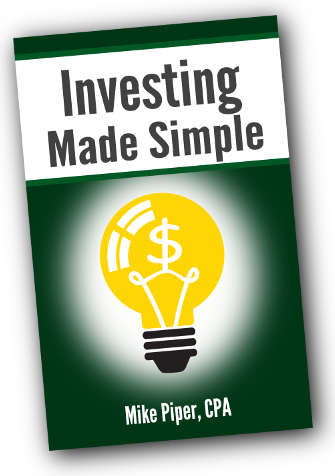 This is a guest post from John Gay, CFP of ffplan.com, an online investment advisory practice. Although not a household name, Folio Investing offers something that virtually no other brokerage firm does: the ability to easily and accurately implement and maintain a percentage-based investment plan. Who does that any more? Most people want to execute a percentage-based asset allocation plan. Let’s say I have 8 different ETFs that I want to buy in a pre-set percentage. To do that at a traditional brokerage firm, I have to convert percentages to dollars then dollars to shares and then individually place each trade. There’s significant time and effort involved, not to mention a high margin of error (what if I miscalculate and buy $100,000 instead of $10,000? what if I overbuy my IRA?). Then, one year later, if my allocation is off, rebalancing involves a spreadsheet exercise which can quickly get time-consuming and complicated (for example, 8 funds across 4 different accounts creates a multitude of calculations and transactions… and if you’re “tax-engineering” your portfolio across taxable and tax-deferred accounts? What a nightmare). Folio’s technology platform is built on percentages. It is similar to a 401(k) environment. You create a “folio” and then “subscribe” one or more of your accounts to that folio. Their platform then does all of the calculations and with a few clicks you are invested precisely according to spec. When you rebalance, Folio offers multiple options from “rebalance only” which buys and sells as appropriate to get you to your target, to “buy only rebalance” and “sell only rebalance” which allow you to deposit or withdraw funds in a way that leaves your account as close to target after the funds are added or withdrawn. The platform alone would be worth paying a premium for, but Folio offers all trades for $4. That includes stocks, ETFs and mutual funds. Even Vanguard index funds can be bought and sold for $4 each on their basic plan (many brokerage firms charge a premium for Vanguard and other funds, sometimes as high as $75!). Do note, however, that Folio’s basic plan fees are subject to a $15 quarterly minimum and they also charge an annual $25 per IRA fee (they outsource the trustee duties to a bank). Folio also offers an “unlimited” plan for $29 per month which allows unlimited “window” trading and discounted stop and limit orders. Other valuable features include an almost paperless account opening and transfer environment, automated “specific share” bookkeeping on taxable accounts, and a simple yet powerful performance screen. The performance screen calculates a true “time-weighted” rate of return over any time period you specify and allows you to compare performance to a multitude of indexes or any mutual fund or stock. Last of all, Folio’s platform allows easy collaboration with others. As a financial adviser, my Folio clients can give me “view-only” access with a few clicks so I can “look over their shoulder” to make sure they have executed my recommendations correctly and to monitor when rebalancing changes are warranted. Or, you can delegate full trading authority to your adviser or someone else to place transactions on your behalf. 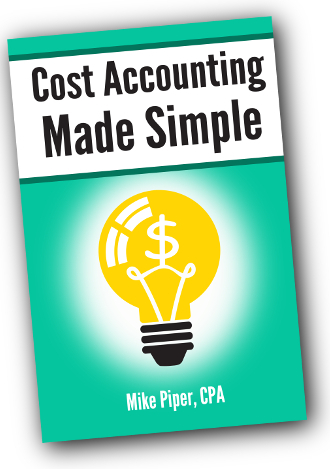 You can also easily give access to your CPA to pull up tax docs, or to anyone else you choose. If you want to give their system a try, you can open up an account in minutes and until it’s funded, they don’t charge you. You can set up “test folios” that simulate the real thing to your heart’s content to decide if their platform will meet your needs. If you think Folio Investing might be a good fit for you, here’s the page to open an account. If you’d like to compare Folio Investing to other brokerage firms, here’s a comparison of IRAs at various discount brokerage firms. Let’s start with the obvious: If you don’t feel that you need a financial advisor, there is absolutely no reason to have an account at Edward Jones. You can go elsewhere and find less expensive funds, less expensive stock trades, and lower account fees. If, however, you do need a financial advisor, should Ed Jones be one of the places to consider? The primary selling point of Edward Jones is their broad network of local offices. In most parts of the U.S., there will be a Jones office not too far from where you live. If face-to-face interaction with your brokerage firm is important to you, Jones is hard to beat in terms of convenience. actively managed mutual funds (i.e., funds that seek to earn above-market returns). That’s likely hundreds of dollars more per trade than you’d pay with a typical discount brokerage firm. Between that and their $40 annual IRA fee, Edward Jones isn’t exactly on the list of cost-effective places to invest. Buy a mutual fund that charges a sales load. This payment system leads to Edward Jones clients receiving advice that’s biased in a few ways. For example, an Edward Jones financial advisor will never recommend a no-load mutual fund (even when that’s the best option for the client) because he/she won’t receive a commission if you purchase such a fund. An additional conflict of interest is created by the fact that Edward Jones receives “revenue sharing” payments from a handful of fund companies. While it’s easy to check your holdings and account balances on Edward Jones’ website, they don’t actually provide any online trading capability whatsoever. If you want to execute any transactions, you’ll have to call your broker. The official Jones position is that the lack of online trading is intended to prevent rash investment decisions. To some extent, that makes sense. Personally, however, I find it frustrating. I want to be able to do what I please with my money without having to talk it over with somebody. In most cases, if you feel that you need a financial advisor, I’d suggest going with one who charges a simple hourly or annual fee rather than one who is paid via commission. By using a fee-only advisor, you’ll get unbiased advice, and you’ll likely reduce the overall costs on your investment portfolio. If you’d like to compare Edward Jones to other brokerage firms, here’s a comparison of IRAs at various discount brokerage firms.